We’d love your help. Let us know what’s wrong with this preview of The Soapmaker's Companion by Susan Miller Cavitch. In this comprehensive guide, Susan Miller Cavitch covers everything you need to know to make your own soaps. Learn the basic techniques for crafting oil-, cream-, and vegetable-based soaps, and then start experimenting with your own personalized scents and effects. Cavitch provides tips for making more than 40 different specialty soaps, showing you how to design colorful m In this comprehensive guide, Susan Miller Cavitch covers everything you need to know to make your own soaps. Learn the basic techniques for crafting oil-, cream-, and vegetable-based soaps, and then start experimenting with your own personalized scents and effects. Cavitch provides tips for making more than 40 different specialty soaps, showing you how to design colorful marbled bars and expertly blend ingredients to create custom fragrances. You’ll soon be making luxurious soaps at a fraction of the cost of boutique products. 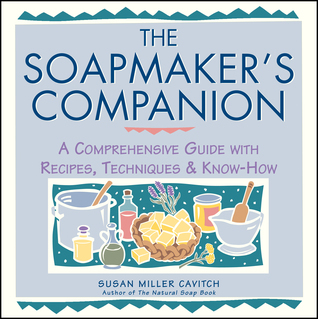 To ask other readers questions about The Soapmaker's Companion, please sign up. Yes you too can make soap. If you can cook and follow the directions its fairly easy. I didn't at first and had a couple of flops that were comical. I used olive oil and it came out very nice. Fun too! I think this book was much more informative than Susan Miller Cavitch's first book "The Natural Soap Book". This book is pretty detailed and great for beginners and experienced soap makers alike. I'm pretty picky though and my search still continues for unique soap recipes. This book got me off on a good start; not to forget to mention I also had wonderful ladies from my church teach me hands on soap making, but now I need just a soap recipe book. I book I check out of the library repeatedly so I can make soap. I am thinking of purchasing a copy for my collection. Very helpful information and soap making recipes, as well as troubling shooting guide. Every recipe works and delivers what it promises. My only prbblem at this time is finding lye for soapmaking. Lots of great ideas and information about aromatherapy, emollients, and other healing things to do to your soap. For the advanced soapmaker. Includes more complex soap recipes and delves into real science. Extensive lists of natural additives and somewhat daunting narrative of legal and administrative aspects of running a soapmaking business. Excellent troubleshooting section. Not bad...I still prefer White's book and suggest that over this one, but this is not bad if you need a book to introduce you into ONLY vegetable cold process soap making it tells you what you need to know when first starting out. I've wanted to make soap for a long time and so many sources say that it's easy but I've never really believed it. After reading this book, I finally feel that I can pull it off. Once I find my thermometer, I'll make soap! I'm so excited to finally understand the process. This is a source of great information - there's lots of it, from technique to science. It was a bit dry and hard to follow at times. Recipes are for large batch. Must read it again to take notes for some of the chemistry breakdown. There's a lot of information in this book. Some of it can be overwhelming if you don't already understand some basics. Also some of the information is kind of outdated. That said there are still some parts that I have marked for reference because they are good and helpful. This book seems a little out of date according to some blogs I've read though it seems pretty comprehensive in its scope, which makes sense considering the title. I haven't been able to try any recipes yet, but I will update once I have experimented a little. This review has been hidden because it contains spoilers. To view it, click here. Discusses details of fats, etc. I just finished this book. My daughter gave it to me for my birthday. I learned the batch of soap I just made has too much lye. OOPS! Fabulous recipies and help for novices and experienced soapmakers too! Very informative book on making soap and the qualities of the ingredients that go into it. 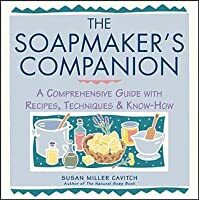 This book taught me how to make soap - great soap from the very first batch! I love this book and still use it every time I make a batch of soap! Great book, easy to understand! Has some great information but is dated. I didn't give this one a thorough read-through because it's more about cold process soap, but it looks comprehensive. I plan to come back to it when I progress a little more in the hobby. I read this upon the suggestion of Elizabeth, as we are planning on getting together to make soap in the new year. It was fascinating and I'm very much looking forward to my new endeavor. Not a bad book, but for a first timer in lye-making, it was a bit overwhelming with information. Ok, who doesn't love handmade soap?? Well, I do! And I learned to make it from this book. Great book for how to make soap. very comprehensive and easy to understand.